This is a very nicely made pillow. I wanted so badly to love it. It really is beautiful. I took all the reviews at face value and jumped into the abyss, purchasing 2 King Candace Olson feather pillows, 2 Queen and 5 Standard. Oh what a mistake! Pillows are so subjective. I figured they must be wonderful with such overwhelmingly glowing reviews. I am sure they are very wonderful for very many people. Just not for me and my family. Universally we all thought they were waaay tooo hard. They fluff up beautifully indeed but compress to a brick. Each and every one of us had a crook neck. Unfortunately we could not return some of them because we had used them. Now we are stuck with pillows that don't satisfy the requisite fluff factor we need in our home. I'd be careful. These really are firm. The Queen the most so out of all of them. Whether this is a fluke or not, I just don't know. The Standard weren't so bad, but the Queen left something truly to be desired. Ouch! So in summation, for some this might be ideal, but for us, we cannot get use to them in any way shape or form. I'm definitely in need of a good massage to sooth out the kinks and stiffness. I am in bed all the time and needed support yet softness. These 2 pillows fit the bill. The zippered protectors are of fine quality. The pillows are a bit smaller than expected but do not detract from the effectiveness. I highly recommend the pillow for daily or decorative use. I purchased the Candice Olson Pillow as well as another brand that was about 4 times as expensive so I could compare them as both had similar descriptions. I was looking for a good quality down pillow that offered firm support for side sleepers. Although the Candice Olson pillow was the least expensive of the two, it had far better quality and support. These pillows fluff up nice and are super comfortable to sleep on in any position. I actually ended up buying a second Candice Olson Pillow and returned the more expensive one since the more expensive pillow just flattened out completely and offered no support even though they claimed it was full and firm. unlike some down & feather pillows, this one is a bit firmer....so take that into consideration....a lovely pillow.....extremely well made. Even though I love my very soft down pillows I needed more support especially when reading or watching television in bed. I purchased one Candice Olson European Goose Feather and Down Pillow just for myself to see how I liked it, thinking if didn't I could always give it to my husband who isn't as picky as I am. :-) This pillow has just the right kind of firmness although at first I thought it was too firm. Now that I've been using it for two weeks it has softened up a bit but is still firm enough to help keep me supported in bed with my other very soft pillow. I've given up using my ultra soft down pillow and use this one exclusively for sleep. My husband now wants one too so I just ordered another. The pillow protector that comes with it is lovely, and has a nice baffle around the edges. I'm a back and side sleeper and this pillow works well with either position. If you're a 'scruncher' this pillow does scrunch but won't go flat. For any friend of mine who wants a high loft down and feather pillow, this is a good buy. It is a little higher than my husband or I am used to, but I wouldn't think of returning it. We have a lot of company and I'm sure one of them will love this "high and mighty' pillow. It would also be great for a bed prop when reading. I was hesitant to buy this pillow for some reason, but I finally pulled the trigger and I must say don't hesitate. This is a great product. If anyone says there is a smell, let me just say that I have a reputation as being a supernose and I smelled nothing when I opened this up. I will say that I ran the pillow through a cool fluff in my dryer for an hour. When in comes in, the pillow gets depressed. It pops right back up. I also do this once a week to keep the feathers plumped up. Just make sure that you don't add any heat when you fluff your pillow. Soft pillows, but provides zero support. They lose their fullness quickly.I have to admit as poor quality as they seem, meaning they only give about 1/4 inch of support when your head is laying on it, I still liked it just fine. Nothing special but works since I like laying flat. I love this pillow. I have been using 'foam' pillows for couple years, and got tired of my neck hurting. This pillow is very well made, and very comfortable. Saved my neck! I was first to purchase for myself after first night the pillows were purchased for my daughter and my mother absolutely best ever pillows for a good night sleep. they feel great, however, a few months after getting them I saw a video of what they do to the animals .... disgusting! Not fluffy like a totally down pillow. Love this pillow. Comfortable to sleep with. I have these pillows in both my master and guest room. What's nice about them is you can throw them in the washing machine and them come out looking brand new. The are a nice density and very comfortable. They don't get hot and stay fluffed up. Not as thick as I had hoped. For a side sleeper, this did not hold my head in alignment with my spine so it was not a useful sleeping pillow for me. It is useful as an additional pillow for support when reading in bed. Got 2 yesterday and I loved these pillows. Cotton with Goose Feathers and Down. No more polyester pillows for us! They are hot and go flat quick. Great price!! I like this pillow, however it seems a bit "overfilled" for my needs and comfort, but I use it to lean back against the headboard to read or watch TV. Beat out Bed, Bath & Beyond (10 min. away) narrowly on their lowest priced pillow type. Because I have a feather and down pillow and my husband keeps taking from me. The price didn't hurt either. "I received my Candice Olson pillow today. Why is there nothing on the labels that indicates this is a Candice Olsen pillow?" Hello ekaran, you will be contacted by Customer Care. Have a great day. "Can you tell me the approximate weight of the king size pillow?" Hello Kim, the approximate weight of the pillow is 7 pounds. Have a great day! "You say the pillow is 70% goose feather/30% down. Please tell me specifically what type of down? What type of goose feather?" It is a natural and sustainable material. European white goose down, has a 300 thread count sateen weave 100 percent cotton cover. "what type of down is this? I'm looking for a pillow to replace mine that is 30 percent white Hungarian goose down"
Thank you for the question.The cover is a 100-percent cotton 300 thread count jacquard scroll fabric with beautiful platinum satin binding. 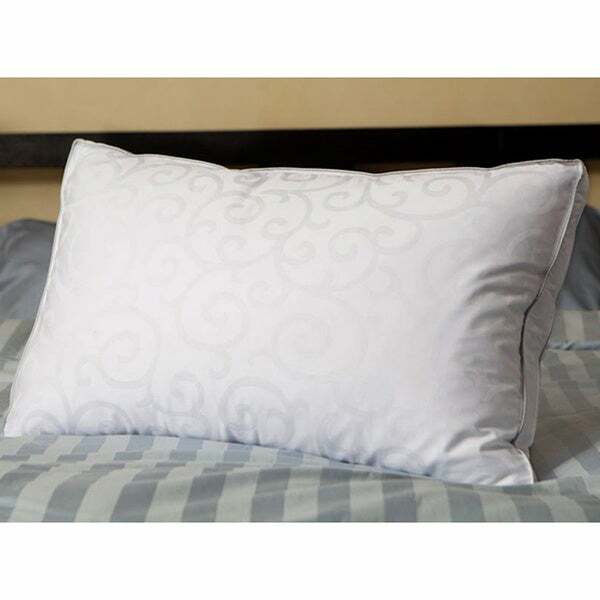 Set includes: Pillow, pillow protector Pillow type: DownFabric construction: 100-percent cottonFill material: 70-percent goose feather/ 30-percent downConstruction: 2-inch gusseted sidewall with satin cordThread count: 300 outer, 233 inner Firmness. Thank you for your question and I apologize for the delayed response. There is no fill power rating for this product because it contains 70-percent goose feather and 30-percent down. To my understanding anything below 75-percent down has no fill power rating.